Mike Ehredt salutes one of 2,300 flags he’s placed in honor of veterans, who lost their life in Afghanistan. 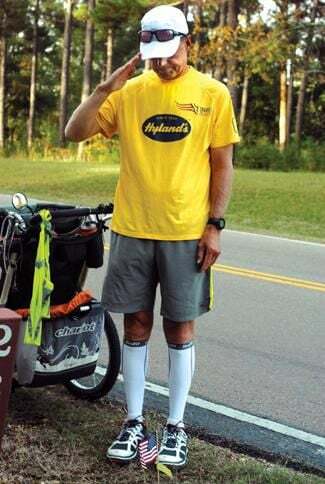 Mike Ehredt is in Raymond today, a few steps closer to his ultimate destination - Galveston, Texas. On Oct. 19 he passed through Tupelo on his 2,300 mile journey. Every mile Ehredt places a small America flag on the roadside. A little yellow banner is tied to each flag with the name, hometown, rank and age of a soldier, who lost their life in Afghanistan. He pauses for a moment, salutes the flag and moves on. The 51-year-old veteran only wanted to see one thing in Tupelo. “The only team I wanted to see play was the Bulldogs,” Ehredt said and pulled a maroon Mississippi State cap out of the portable baby stroller, which he pushes. It contains snacks, changes of clothing and the flags. He spent the night with Berryhill. At the end of the day’s run the ranger will pick Ehredt up at Houston, bring him back, he’ll spend another night and then he’ll be dropped off at the exact spot he quit, to begin again. “Mississippi has been one of the most receptive states, living up to their motto of being the hospitality state,” he said. Ehredt has passed through Minnesota, Wisconsin, Iowa, Illinois, Kentucky, Tennessee, Alabama and Mississippi thus far. Just about every day brings a memory or a favorite spot but so far it’s a landmark just off the Trace, Bill Roper told him about. He stayed with the Ropers at their Fall Hollow Campground, in Hohenwald, Tenn.
“It was seeing this enormous wall that one guy built,” Ehredt said. The huge stone wall is dedicated to Te-lah-nay, an Yuchi Indian. It’s over 12 feet thick and is made of tons of rocks from all 50 states, several countries (143), and one meteorite. The wall supposedly took 27 years to built, and during the course of the construction saw the end of 39 wheelbarrows and three pickup trucks. It was easy to see why this impressed Ehredt. Along the way people, with relatives serving in Afghanistan, have joined him walking or jogging as he passed near their home towns. He plans to hang up his shoes once he reaches the Gulf of Mexico. The quiet, confident man turned his buggy south, tipped his cap and headed down the Trace — just another day at the office.